Styled to Profit: Turn Your Child’s Bedroom Into Hogwarts! Turn Your Child’s Bedroom Into Hogwarts! Harry Potter is a magical universe created by JK Rowling and it is without a doubt one of the most successful children’s book series of all time. If you have a child who loves all things magic and enjoys Harry Potter and all things Hogwarts, it could be a fun project this year to create a Hogwarts inspired bedroom. Here is what you can do. The main feature of Hogwarts is that iconic castle which towers over the landscape and looks beautiful from afar. You can use the wall behind your child’s bed to create a castle mural which can be as simple as a black silhouette of the castle or as detailed as you want. You might even be able to find Hogwarts Wallpaper to use instead. Your child likely already knows what house they belong to, and depending on what they choose you can have a certain theme running through the room. If you have a plain chest of drawers to play around with, you can make a magical chest of drawers which look like a suitcase pile in the room. The top drawer can be painted to be the house colours, the middle can be painted as a wooden suitcase, and the bottom can be painted black and grey to seem like a different style of suitcase. Create a cardboard name tag and place it on the bottom drawer and you will have a stunning set of ‘suitcases’. The Hogwarts common rooms and dorms have a very old fashioned English feel to them and because of this a lot of the design is simple and in block colours. 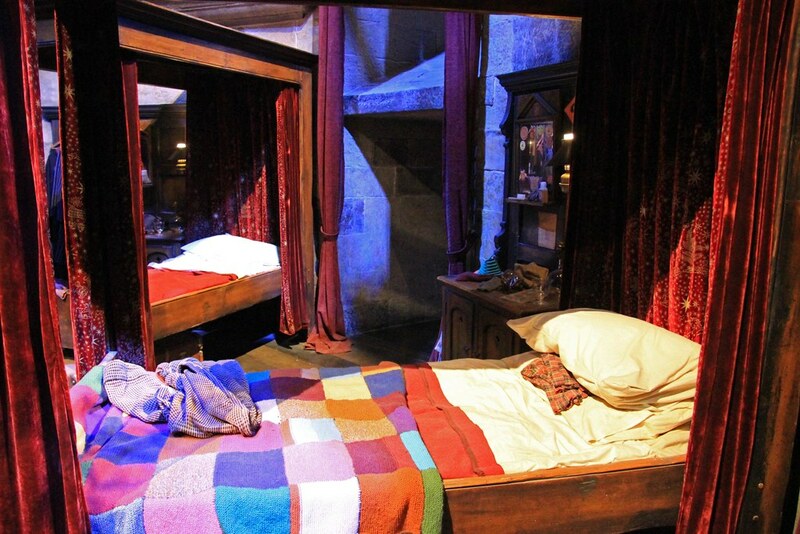 One feature of the beds in Hogwarts is the colourful patchwork quilts which you can make yourself this weekend. All you need is a bunch of square pieces of fabric in different colours and a needle and thread or sewing machine. Patch the pieces together to make a colourful and quirky quilt for the bed. The beds in Hogwarts are magical and regal looking and they have four posters to make the child feel safe and secure at night. If you want to make a Hogwarts style bed for your child, you can either buy a four poster bed and look at the online mattress store for the rest, or you can make four posters and hang some fabric off them yourself. It is a simple craft to do and you can transform the look and feel of the room instantly by doing this. Of course, no magical room can be complete without hanging a few large Hogwarts House banners from the walls. You can either buy these or make them yourself with some fabric and fabric paint. Your child’s room will be instantly transformed into a stunning magical dormitory and they will feel as if they have just received their Hogwarts letter for the first time! It will be amazing and it will feed their imaginations for years to come.